Summer has settled in nicely. I know this well by taking inventory of dust accumulating on the furniture; mail that has not been shredded or filed; and on the upside, outdoor planters filling out with emerging blossoms. I have all winter to fuss with things inside, but when summer is here, I prefer to be outside working with my flowers and soaking up the sun’s rays. “Dust will keep” mother used to say. She used to say that, but somehow she managed to grow copious amounts of vegetables; gloriously filled flower boxes; and still, maintain floors you could eat off and furniture in which you could see your smile. Sadly, I am not my mother. How my mother accomplished so much remains a mystery, but I am like her in the ways of enjoying baking. She had two cookbooks; a larger than life recipe box; and a head that held more recipes than the internet. Seriously. Ask anyone who knew her. I have her recipe box. I also have a collection of nearly 100 cookbooks. I just ordered another. Lest you think I have them just for the recipes, I am here to tell you I do not. I search out ones that harbor histories about food preparation and serving. When reading them, I learn much about people, culture, and the present state of the economy. I was talking with a good friend about strawberry chiffon pie and discovered the pie of her childhood was different than mine. She is a little older than I and recalled her mother making it with whipped cream and strawberry jello. 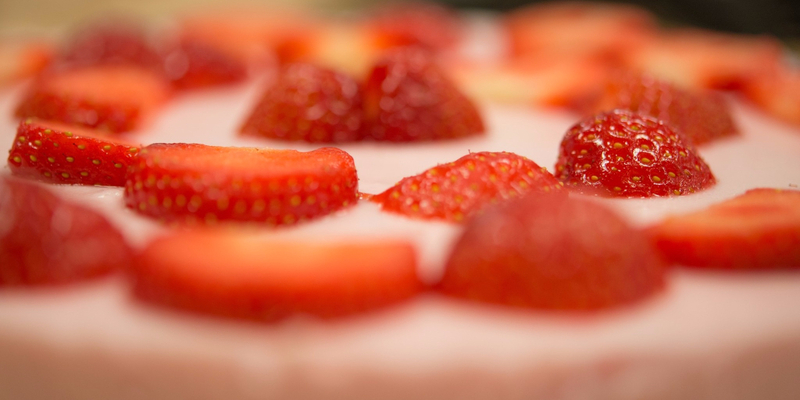 The pie of my childhood made with whipped egg whites and fresh strawberries is what I remember. I did some digging in my older cookbooks to find the recipe, as this was one mom kept filed in her head. Thanks, mom. Monroe Boston Strause, known as “The Pie King,” invented the chiffon pie in 1926 when cakes were becoming more popular than pies. I can’t imagine that. I would choose pie over cake nearly every time. When his mother sampled it, she compared it’s delicacy to a pile of chiffon. Hence, the name, “chiffon pie.” This pie collapses in your mouth much the same way as cotton candy melting in your mouth. 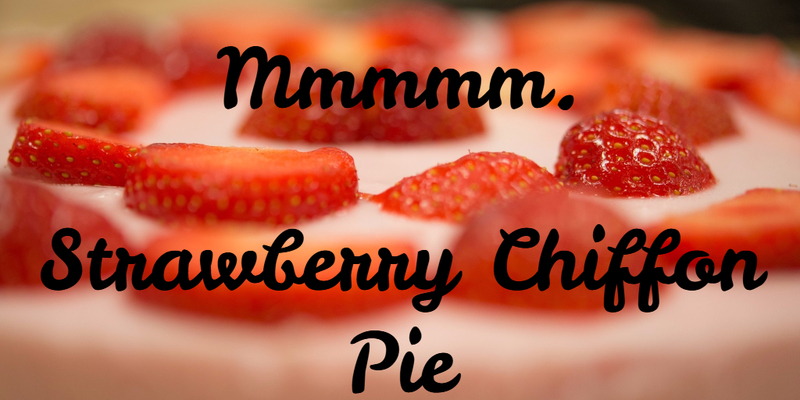 Strawberry season is peaking, and I haven’t been able to get this pie off my mind. Today I’ll share my updated version. First a few cautions. This recipe uses uncooked egg whites and shouldn’t be served to children, the elderly, or those with compromised immune systems. Use fresh eggs. Don’t allow the egg inside to touch the outside shell. Put the dry ingredients into a bowl and mix, breaking up any lumps. Add butter, maple syrup, and water. Combine thoroughly with a spatula. Turn the dough into a 9” pie plate. Flatten on the bottom and up the plate sides. Bake for 20 min or until golden. Remove from oven and cool. In a blender or food processor, puree the strawberries. Pour through a fine mesh strainer to remove seeds. In the top of double boiler, whisk together 1 ½ cups puree, egg yolks, ¼ cup of sugar, and vanilla. Place over a pot of simmering water. Whisking constantly, cook until the mixture thickly coats the back of a spoon or reaches 160°F. Remove from heat. Whisk in gelatin until completely melted. Chill bowl of mixture in an ice bath until slightly thickened. In a fresh bowl, whip egg whites, salt, and tartar with a whisk or electric mixer until the whites are frothy. Gradually add remaining sugar and continue to beat until forming soft peaks. A third at a time, completely fold egg whites into cooled gelatin mixture. Pour into pie crust and chill until firm, about 4 hours or overnight. Just before serving, you may wish to top with whipped cream and adorn with a few sliced strawberries. Makes 8 servings.